There isn’t one way to just obtain a debt consolidation loan or to pay off all of these debts. In fact, there are numerous amounts of ways you can consolidate your debt. So what are the best methods to consolidate dent and which one is better for your needs? Before we discuss the best ways to consolidate debt, we need to define what this means. Imagine you have a series of loans and debts you need to pay off. This can be a hassle. Keeping up with all of these small loans can really eat at you, but imagine if there was a way you can take out one big loan, and then use that loan to pay off all of the smaller debts you owe. Baruch Silvermann explained this in a wonderful article on debt consolidation. The result is paying one bill a week, month, or however long to pay off. Wouldn’t it be kind of better to know once you pay off this big loan, all of the debts you owed are now finished? That you don’t have to worry about the small details of specific loans or take the risk of forgetting about them? This is what is called “debt consolidation”, and getting a debt consolidation loan is what can really help you do just that. The loans can be very beneficial. However, debt is never a good thing. These debt consolidation loans are just meant to help you stay “on track” and to also save yourself the headaches later on. There isn’t one way to just obtain a debt consolidation loan or to pay off all of these debts (The interest you pay on your debt can quickly become very expensive. You can use our calculator to help determine just how expensive your debt has become). In fact, there are numerous amounts of ways you can get them. What we’re going to talk about here is the most common ways United States citizens consolidate debt. A lot of times we find ourselves owing debts on our credit cards. That’s just how life works sometimes. Something comes up or some crazy accident happens and we need to use our credit cards. If you have multiple ones, though, it can be extremely frustrating to fix and get on the positive. One way to aid this is by transferring your balance on your credit cards onto one account. Well, a lot of credit card companies actually promote their low-interest rates and say anywhere from 0% to 5% is the interest rate for the first three to 18 months (And as we know, interest rate fluctuations has a big impact on any kind of investments). This window of opportunity is available to pay off the complete amount you owe, without adding interest. You could put the amount of all your credit card debts into one. With the company’s “no interest rate” for a set amount of time, you have a window to not pay interest. This can all be extremely beneficial, especially since you don’t have an interest rate for a while. Just keep in mind when your three to 18 month “no interest rate” is expired. If you would like to do this, you need to find a credit card company that lends the total amount you owe. There are downsides to these companies, though. The con to this is potentially taking a hit to your credit score. Credit scores mean a great deal to us today, as they should. Stacking all of your debts on one card could hit your score. Other than that, you will need to meet some requirements. You will need a good credit score and a good credit history when doing this (We hope you already know how to get your credit score for free ). Also, bear in mind that if you go past the window of opportunity for paying no interest, you will then be charged interest until the whole amount is paid off. Side note- remember that to transfer these debts to one card might require a service fee of anywhere from 2%-5%+. Pay attention to details and understand all of them! You could have possibly heard this as a “second mortgage”. Basically, this is taking out a loan from a bank or another lender and using your house as collateral to acquire the loan. This can be beneficial, but it can also be risky. Also in this case – you should always pay attention to details and make sure you ask the right questions! Typically, the people who get these loans have good credit. They also have a fair amount of money in their house for it to be worth the loan. Usually, a key benefit to this would be having a lower interest rate. You aren’t stacking a lot of money on top of what you owe, just a fraction of it. Also, you can put a good amount of money into your house and qualify for more money. You should be careful, though. Note that this method puts your house at risk if you are unable to make the payments. This results in a foreclosure. Seeing those signs up and around always brings you to be melancholy. If you have ever had a friend or family member that had their home foreclosed, you know the tragedy and heartache it brings. It does have very low-interest rates and can sound appealing and ideal. Just be cautious, especially if you have a family. You are making a tradeoff for this loan. It’s risky, especially if you aren’t 100% positive you can pay it off. If you fall behind, you can lose your house, and be taken to court being demanded to pay up. It can really wreck your life, and it should not be taken lightly. Try reading examples on the internet about people’s stories where this happened to them. Getting a line of credit can help pay off your debts. Often times these credit unions/banks can get you approved for the line of credit. You just need to have a well-fitting credit score and a good/steady income. You can then use this to benefit your situation. Keep an eye on your credit score and make sure it is as good as possible. This can help you understand if you are likely or not get approved. It also helps you understand whether or not you should be looking for lenders in the first place. Because of this reason, if your credit score is bad or even just “okay” you won’t be approved. The lenders generally like to have a 100% feeling of the person they loan to. They don’t like to risk. On the other hand, getting approved with “okay” interest might cause the lender to jack the interest rates “sky high”. It might not even be worth the line of credit in the first place. On the other hand, getting approved with “okay” interest might cause the lender to jack the interest rates “sky high”. It might not even be worth the line of credit in the first place. Bare in mind that collecting this high interest could take a long time to pay off. There are debt repayment programs to help you get out of debt. This help when you cannot seem to get approved elsewhere. These programs promise you to have 0% interest rates and to be out of debt within a few years. They also roll your payments into one big payment. Like I said earlier, this can be very beneficial and save a lot of time in the long run. Like with all loans and services, be careful. There have been some instances where the person seeking help is scammed. The best thing I recommend is to speak with a non-profit Credit Counsellor. You should think and put a great deal of energy into deciding whether or not to get a secured loan. These can be beneficial but can also lead to cons and risk along the way. These aren’t ideal for borrowers who aren’t good at paying off bills. They can be beneficial for those who know how. These have lower interest rates but can be risky. There are people who have started foundations and programs that offer free services to help those with debt. You can consider a personal loan from different types of sources, depend on your credit score eligibility. We have all been there or close to debt. It’s an awful feeling to be fighting to stay afloat. Check out the National Debtline or the Consumer Credit Counselling Service for information and help with these debts. The worst thing to do is not browse and to not find help. Besides loans, you can also borrow a life insurance policy. It’s an extreme risk, but there are those who have done it to manage their debt. You generally are able to borrow the amount of money you owe on your loan and then use it to pay off the debt. You aren’t billed if the amount borrowed is less than what the policy is worth. I, however, recommend you make these payments. In the worst case scenario, you die, and you pass what on to your family? Nothing. That’s tough. That is about as tough as it gets… all to pay off the loans you acquired. So if you use this method, please pay back as much as possible to the life insurance providers. Consider this option only in emergency cases. There are actual and literal debt consolidation loans given by a credit union/bank to help those who need them. Like I said earlier, this can help by combining a series of your debts into one, making it clearer and easier to read. These loans can vary on amounts and interest rates. Be sure to ask questions and take notes when talking to a representative or browsing online. These generally have lower interest rates than those you are paying. Make sure to pay attention to details, and especially see how long the payment periods are. These have looser guidelines and rules for who is approved than credit unions or banks. Be aware that the interest rates might be incredibly higher. This could ultimately cause you to be worse off than where you started (I’m talking about interest rates up to 47% here). Sometimes you will be denied a loan even if you have an “okay” or “fair” credit score. What can help? A low interest credit card. Generally, if you have a good credit score you can be approved for a credit card (and if not, read our article on how to repair a bad credit). So if you go with this approach, be cautious like always. You have to really set rules for yourself and make sure you pay the minimum amount monthly. You don’t want to be paying off loans for years or even decades because you can’t discipline yourself. Finally – you can always try to reduce your credit card interest rate. This, like the life insurance policy method, should be a method that is used after everything else fails. You can borrow money from most retirement plans. Don’t change jobs, though. If you switch up your job, the loan is due within 60 days, or you could be at risk of penalties. In case that isn’t bad enough, you have to pay it all back within five years. If you don’t, you will be charged a fee for early withdrawal as well as income tax. 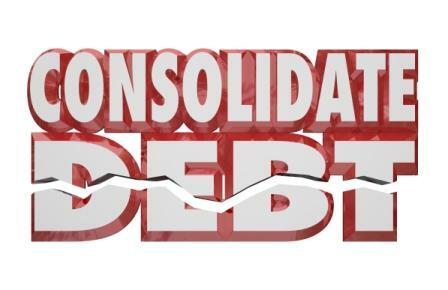 There is a multitude of ways to consolidate debt. Please investigate in detail each one. Each has their own pros and cons, but some can be worse than others. Start by visiting free sources and free websites to help you understand what is at hand and what would be “too much”. Most of all, know you aren’t alone. Often times, we feel like we are the only people that make mistakes and that our bad situation only happens to us. Look up, and get started on tackling the debt head-on! Good luck!